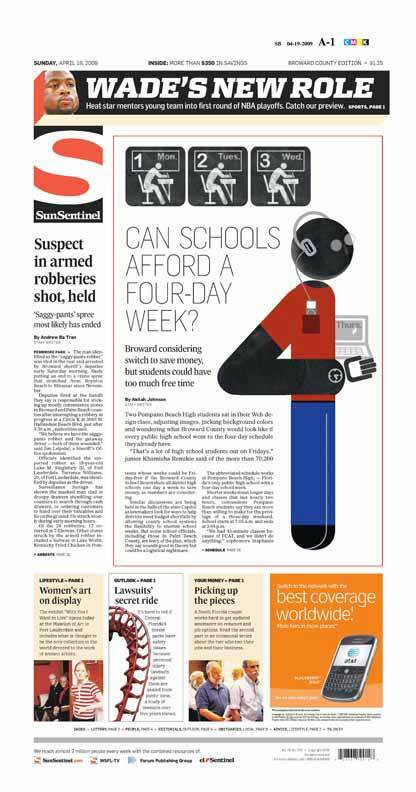 Can schools afford a four-day week? Two Pompano Beach High students sat in their Web design class, adjusting images, picking background colors and wondering what Broward County would look like if every public high school went to the four-day schedule they already have. “That’s a lot of high school students out on Fridays,” junior Khamisha Remikie said of the more than 70,200 teens whose weeks could be Friday-free if the Broward County School Board shuts all district high schools one day a week to save money, as members are considering. Similar discussions are being held in the halls of the state Capitol as lawmakers look for ways to help districts meet budget shortfalls by allowing county school systems the flexibility to shorten school weeks. But some school officials, including those in Palm Beach County, are leery of the plan, which they say sounds good in theory but could be a logistical nightmare. The abbreviated schedule works at Pompano Beach High – Florida’s only public high school with a four-day school week. Shorter weeks mean longer days and classes that last nearly two hours, concessions Pompano Beach students say they are more than willing to make for the privilege of a three-day weekend. School starts at 7:05 a.m. and ends at 3:05 p.m. In fact, the six-page Web site, complete with dynamic graphics and audio slide shows, that Zielinska and Remikie are working on would be almost impossible to complete in a traditional 50-minute class, their teacher agreed. About one in four school districts nationwide have either dropped a day or considered doing so to cut costs, according to a 2008 survey by the American Association of School Administrators. Mostly small, rural districts have switched to truncated schedules, educators say. Louie F. Rodriguez, who teaches urban public education at Florida International University, said shortening a school week is a structural change that doesn’t necessarily improve or harm classroom learning. Having more impact, Rodriguez said, are relationships between students and adults and a school’s culture. “That’s not going to change if there’s a high-quality teacher in the classroom five days a week or four days a week,” he said. Pompano Beach High began compressing five days of regular classroom learning into four about eight years ago. And now Broward, like the rest of Florida, is considering carving a day from the school week to save money by not having buses rumbling down streets or air-conditioning systems cooling schools. But with a $130 million budget cut in the past two school years and another $75 million cut expected for next year, it’s a conversation Broward school officials say they must have. The sentiment is different in Palm Beach County, where Art Johnson, the schools superintendent, has said he can’t recommend unleashing all the students on the community when most adults are working, no matter the savings. Debra Robinson, a Palm Beach County School Board member, says many parents would be extremely inconvenienced by a four-day school week. Pembroke Pines Commissioner Angelo Castillo said the shorter school week might work with “better motivated students” at magnet schools. While elected officials might mind the condensed school week, some parents of high schoolers feel differently. Mark Scanlon said that as long as Cypress Bay High School in Weston keeps its block-class schedule – dividing the day into four, 90-minute classes – he doesn’t mind if his daughter, a freshman, gets a three-day weekend. Pompano Beach High Principal David Gordon said the truncated week works at his school for two reasons. First, the entire campus is a magnet, meaning all 1,200 students must maintain a 2.5 average to stay in its international affairs, international business or information technology programs. The other reason: the school’s block schedule. “The block is critical to me,” Gordon said. With that schedule, he explained, nothing is sacrificed academically. Gordon’s students may spend Fridays away from campus, but they still have take-home schoolwork, even if it’s less than at traditional schools, students say. Ask a senior round table how they spend their day off and you’ll hear itineraries packed with volunteer hours, household chores and school assignments. Senior Alan Gates said he sleeps in until about 9 a.m. Fridays, only to spend the next seven to eight hours doing homework. “But I go at a more relaxed pace,” the 17-year-old said. There are TV and Facebook breaks, with a long lunch thrown in for good measure. He calls it a day by 5 p.m. – homework complete and the rest of the weekend ahead of him. Gordon said he hopes students manage to sneak in a little beach time every now and then, given the eight-hour school days. “We beat them up pretty good for four days,” he said. Staff Writer Marc Freeman contributed to this report. Akilah Johnson can be reached at akjohnson@SunSentinel.com or 954-356-4527.